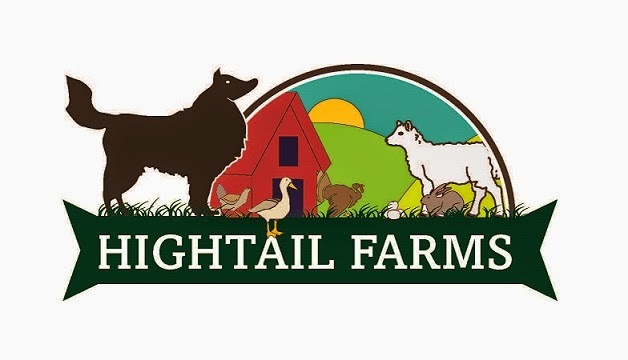 HighTail Farms: Lousy with Lambs! Marcie is getting bigger every day. In fact, she is growing so fast that sometimes at a distance we confuse her with the yearlings! A couple weeks ago she scared us by developing a swelling around her jaw that we were just sure was bottlejaw. This was a little mystifying since she has been growing so fast and looking so healthy. We checked her eyes and they were as pink as could be. (Normally, bottlejaw is an indication of severe anemia due to parasites). We gave her a dose of dewormer and waited. She stayed fat and healthy, but the swelling just would not go away. A little more research and we realized that she actually had a milk goiter which is completely harmless and should go away once she is weaned. I guess we should thank Pepper for making such good milk! Louise was the next to give birth to a little ewe lamb that we are calling Applesauce because the end of her muzzle is all brown like she dipped it into something. This year we are also trying to stick with 'A' names for the lambs...at least for the most part. Up next was Whoopi with ANOTHER ewe lamb that we affectionately refer to as Almost. Almost was born with a short tight coat and looking a mess. You can see in these pictures that her backend is covered in poop. She was actually open mouth breathing just from walking around with her mother in the picture above. The day that she was born, Big Onion and I had to go to work. We were just sure she wouldn't make it thru the day, and we would be having to deal with a tiny lamb body when we got home that night. Almost pulled through the first couple days still looking weak and sickly so we decided to give her a little help. We gave her few vitamin shots (B complex, E, and selenium), a few mouthfuls of oral vitamins, and gave her backside a good cleaning. In no time, Almost was looking great. Hopping around the pasture with the other lambs and growing big and strong. I guess she just needed a little boost to get going in life. I told Big Onion we need to change her name to Absolutely! Tina had our only ram lamb so far this year. He's a handsome boy with interesting markings. I just love his little chocolate pasterns. And his squishy little ram face. We had high hopes for Maggie since she lambed last year. We were sure she'd give us our first set of twin on the farm. Instead, she made one beautiful little ewe lamb that is the spitting image of Emma, her lamb that we lost last year. We've decided to call this pretty little girl Ammie in honor of her lost sister. All the girls lambed on their own without any problems and are doing a great job at mothering, no lost or abandoned lamb. All the babies always have full bellies, and our mommas all have huge but healthy udders. Katahdins are known for these traits, and I'm happy to say that our girls are living up to the hype. that pic of almost/absolutely is a scream! i love it! great work doctoring her up! She turned around quite a bit! I'm glad she was born when she was -- I don't think she'd be that well off if she had been born in the middle of our (short) winter! I think that coat will do her well over the summer, too. great photography of your lambs.